Last year, I wrote a post about the landscape of standards development organizations, industry-alliances and company consortia . Several recent developments have led me to revisit the topic. There are signs that the IoT market is maturing. Users and service providers are well beyond the first hurdle of understanding a new capability and set of enabling technologies. And, businesses are exploring the longer-term road map for IoT solutions and the underlying enablers they will need. Nigel Upton, Worldwide Director and GM IoT/GCP at Hewlett Packard Enterprise (HP-E) encapsulated the issue, from a business standpoint, in a recent conference presentation . He advised companies that they could simplify their IoT strategies by using a common platform, a common data model and an IoT standard. It so happens that HP-E chose oneM2M, viewing it as the best supported standard on offer. These observations reminded me of an analysis I did for a Japanese client last year to navigate a path through the standardization landscape. In essence, I looked at the various efforts that formal standards development initiatives (i.e. 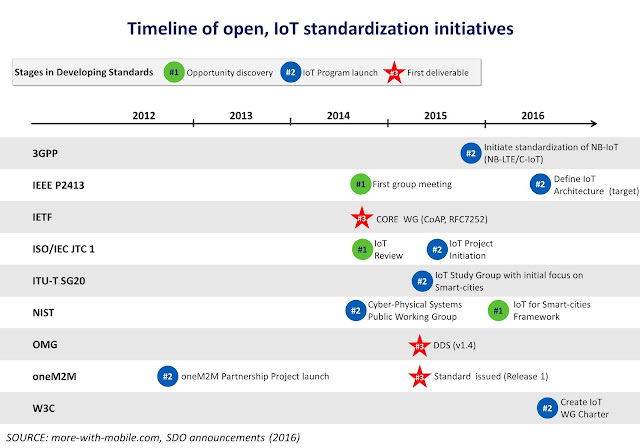 aiming for open standards among other factors) were launching to capitalize on the IoT opportunity. I picked ‘elapsed time’ as a key dimension to compare different initiatives. It helps to visualize an early recognition of the market opportunity. The time dimension also allows businesses to gauge progress based on cumulative work effort and the regularity with which usable results are delivered. This comparison shows that the oneM2M Partnership Project has a considerable time advantage relative to other IoT efforts. In the grand scheme of things, however, there is still a way to go. Jim Nolan (EVP, InterDigital Solutions) put matters into perspective when he talked about the roughly 8-year period to develop, implement and stabilize a new standard  in the mobile communications arena. By this metric, the IoT industry is perhaps half way into the process. It was therefore interesting to see HP-E, a mainstream solution provider in the communications and systems-integration arena, cut through the cluttered debate on IoT standardization and highlights its adoption of oneM2M. Separately, Arvind Gopalakrishnan, VP Sales Engineering, Solutions and Customer Success at Aeris Communications, an established M2M/IoT service provider, also wrote about standardization in the Industrial Internet. His article  drew attention to the commercial interoperability benefits of oneM2M. These North American data points may well point to this important market following the lead of countries such as India (high volume, smart-city and transportation sector opportunities) and S. Korea (national master plan for IoT) in embracing the oneM2M standard. In terms of comparative advantage, other standardization organizations face an issue in either catching up with the first-mover’s invested effort or looking for ways to collaborate and maximize re-use. As industry attention moves away from connectivity standardization to interoperability, there is also an issue for proprietary IoT platform providers. Do they continue to plow a closed-solution furrow, move in the direction of inter-working capabilities, or migrate to an open standard? DISCLOSURE: I have worked with several organizations that participate in the oneM2M Partnership Project, including some (but not all) of the companies referenced in this post. 3GPP - Collaborative alliance between seven international telecommunications associations. Its IoT activities are focused on C-IoT (LTE) in the short term and NexGen (IoT and 5G) in the long term. IEEE P2413 - IEEE P2413 is a standards project run by the IEEE with the aim of developing a horizontal architecture framework for the IoT based on common definitions and a reference model that defines secure relationships between various IoT verticals. IETF - The Internet Engineering Task Force (IETF) has established several working groups on various aspects of the IoT: CORE (Constrained RESTful Environments), 6TiSCH, 6LO, ACE (Authentication & Authorization for Constrained Environments), and DICE (DTLS in Constrained Environments). ISO/IEC JTC 1 - The Joint Technical Committee of the International Organization for Standardization (ISO) and the International Electrotechnical Commission (IEC) have produced a number of reports on emerging areas such as big data (WG 9), the IoT (WG 10), and smart cities (WG 11). ITU-T - The role of the United Nation’s ITU-T expert group is to coordinate standardization within the telecoms industry. In 2015, it launched Study Group 20 to address the IoT with a special focus on smart cities. NIST - The role of NIST’s public working group for cyber-physical systems is to define CPS systems and their relationship to the Internet, and to identify common architecture and service functions. The objective of NIST’s technical working group for IoT-enabled smart cities is to draw together early-stage activities in other SDOs and industry consortia in order to address issues of interoperability, portable designs across cities, extensibility, and cost-effective solutions. OMG - The Object Management Group is a standards consortium focused on enterprise integration technologies. It promotes the DDS standard as an IoT protocol for enabling network interoperability for connected machines, enterprise systems, and mobile devices. In 2014, the OMG announced that it would be managing the newly formed Industrial Internet Consortium (IIC). oneM2M™ - Comprising eight international SDOs, oneM2M™ creates standards for common IoT service enablers across multiple verticals. W3C - The W3C is the main international standards organization for the World Wide Web. In 2015, it launched its Web of Things Community Group to accelerate the adoption of Web technologies as the basis for enabling services.